Malaria is one of the oldest and deadliest infectious diseases affecting man. It is an ancient and modern disease – descriptions of illnesses similar to malaria are found in ancient texts from China, India, the Middle East, Africa and Europe. Africa carries a disproportionately high burden of malaria cases. In 2015 214 million people across the world were infected with malaria leading to about 430 000 deaths. Of these, 90% occurred in Africa. And two countries on the continent, Nigeria and the Democratic Republic of Congo, accounted for more than 35% of global malaria deaths. There has been some improvement. Between 2010 and 2015 there was a 21% reduction of malaria cases reported on the continent, and a 31% reduction in number of deaths. But Africa needs to urgently put a number of additional measures in place to speed up these advances, and to move towards eliminating the disease. These include accelerated investment and deployment of vaccines, new diagnostic tools, new funding strategies for malaria control and keeping in check the drug and insecticide resistance challenge. Funding is also key if African countries are going to move closer to eradication. Evidence shows that eliminating malaria in Africa has been weakened by the lack of sustained funds. the quality of antigen based rapid diagnostic malaria test kits. They do not detect sub-microscopic levels of malaria parasites. In addition, malnourished children do not absorb antimalarial medicines sufficiently to obtain levels in the blood stream that effectively kill the parasites. It’s clear that more potent interventions are urgently needed. Investment in accelerated development and introduction of vaccines should be prioritised. 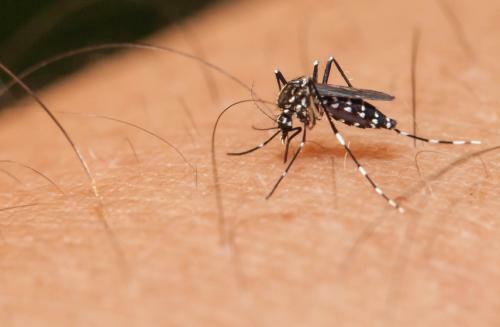 A malaria vaccine candidate that is currently under trial in Africa, RTSS, has shown a modest 39% efficacy. It has also shown promise with a prediction that in fully immunised children it can avert 484 deaths per 100,000. On top of this, more funding needs to be made available as it has a direct impact on the ability of countries to bring malaria under control. For example, in Zanzibar the malaria rates rose and fell with funding levels between 1960 and 2013. Between 1981 and 1983 Sao Tome reported no malaria cases due to consistent indoor residual spraying of households with DDT twice a year and and weekly administration of drugs to prevent the disease. When the funding dried up, a major epidemic occurred in 1985 and by 1997 malaria prevalence had risen to 53%. Sao Tome has recovered to the point that it is now in the pre-elimination phase. With the current low transmission rates, the end of malaria could be in sight with the annual incidence dropping from 33.8 per 1,000 people in 2009 to 9.7 per 1000 in 2014. In Kenya, transmission in the highlands of western Kenya was reduced for between 2007 to 2008. This was attributed to widespread indoor residual spraying and the introduction of artemisinin based combination medicines with support from the Global Fund. Infrastructure challenges: weak health systems, resources like manpower, inaccessibility to malaria control services and poor surveillance systems are to blame for a weak roll out during the implementation phase. Health systems are under-resourced and poorly accessible to those most at risk. In 2015, a large proportion (36%) of children with a fever were not taken to a health facility for care in 23 African countries. Drug resistance: it’s worrying that signs of resistance to artemesinin has been reported in about 12 African countries. This follows the rapid spread of drug resistance first reported in the greater Mekong region in south East Asia. Insecticide resistance: since 2010, 60 of the 73 countries that monitor insecticide resistance have reported mosquito resistance to at least one insecticide class used in nets and indoor spraying. From these samples, 50 reported resistance to two or more insecticide classes. To achieve low transmission rates and eventual elimination, African countries need to invest in understanding the geography, evolutionary history of flora and fauna, infrastructure and land use in Africa. An analysis into the eradication of malaria historically found that by understanding and addressing these factors, malaria control can be more successful. In addition, African countries need to diversify financing of malaria control. The initiatives should be cost effective to ensure they are accessible and evenly rolled out even in the continent’s poor resource regions. And a national health financing strategy and road map to universal health coverage should be developed and implemented in sub-Saharan countries with a high burden of malaria. All partners from the public and private sector, the civil society, development partners and the community should be involved. One of the reasons that community involvement is important is because it encourages ownership which leads to credible data which in turn makes it possible to monitor progress. Africa has unfinished business before it achieves the aspirational theme of World Malaria Day – “End Malaria for good”. Robust investment and new malaria control tools are urgently needed to propel countries towards eliminating the disease.